6 5/8 x 4 1/2 in. During the Middle Ages, hand made devotional books with text and illuminations were particularly popular in Northern Europe. They contained prayers and biblical passages for use in daily worship and were small in size in order to be carried easily. Often they included a calendar that made note of saints’ days and religious feasts. 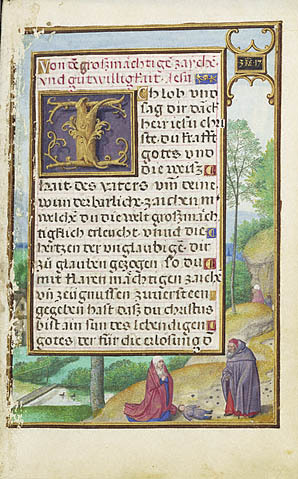 Flemish artist Simon Bening’s finest work was found in his books of hours (containing the seven canonical prayers of the Church). In them, he included many paintings depicting people at work in labors associated with the seasons. They often were in landscape settings. In the early sixteenth century, the Renaissance was well established in Italy but in Northern Europe, Gothic influences were still lingering. Yet, change was taking place and although the use of devotional books was declining, Bening’s reputation was well established. An art critic of the time referred to him as the greatest master of illumination in all of Europe. Although his work was in demand, they were not created for the men of the fields. His commissions came from aristocrats and the very wealthy. Among them were the royalty of Spain, Portugal, and Germany. These commissions enabled him to enrich his paintings with the finest of materials including gold leaf and vellum. Today his books are placed in museums. Although the widow of Zarephath was blessed to have Elijah staying at her home, her good fortune turned to grief when her son became ill and died. Elijah took the dead child to his upper room and placed him on the bed; he then cried out, “O Lord my God, let this child’s soul come into to him again.” God answered Elijah’s prayers and the child returned to life. Upon seeing her son alive again the widow said, “Now I know that you are a man of God, and that the word of the Lord in your mouth is truth” (1 Kings 17: 21-24). Simon Bening’s painting is a border around a text on the subject of the power of Christ. “Elijah Raising the Son of the Widow of Zarephath” is on the opposite side of a page depicting the raising of Lazarus; thus a connection is being made between Old and New Testament events. We are familiar with creative license such as changes and modifications in motion picture biographies. Changes are made in art as well and a common practice is to move the location of an event to a familiar setting. Instead of the widow’s son being taken to an upper bedroom where he is restored to life, Bening places the three principal participants in a peaceful landscape. The widow’s child, like a small lifeless doll, is lying on the ground while she kneels beside it. Elijah stands in prayer. The narrative continues on the right side where we see the widow departing with her son who is now alive and well.